We already know that reading aloud to children expands and deepens their vocabulary and understanding of how language works. Early childhood storytimes provide a venue to demonstrate best practices for reading aloud for parents and caregivers and allow our littlest learners to discover new interests, hear narratives that capture their families and experiences, and expand their horizons with stories about the world and the people around them. Diversifying the stories we offer during storytime can deepen the connections we are making and further our goal of building a solid reading foundation. As of 2014, racial and ethnic minorities surpass non-Hispanic whites as the largest group of American children under 5 years old. (Bloomberg Business). By 2050, immigrants and their children are projected to make up about 37% of our population. Of the 40 million immigrants who have arrived since 1965, about half of them are Hispanic and nearly 3 in 10 are Asian (Pew Research Center’s The Next America). In the 2014–2015 school year, the majority of students in America’s K–12 public schools were comprised of children of color (Education Week). Bottom line: The United States is becoming more multiracial and diverse, and babies and toddlers are leading the way. That means our patrons are getting more diverse and their future classmates will represent many more colors of the rainbow. Whether our libraries serve multiple populations, races, ethnicities and communities or mostly one group, we owe it to all our readers (and soon-to-be readers!) 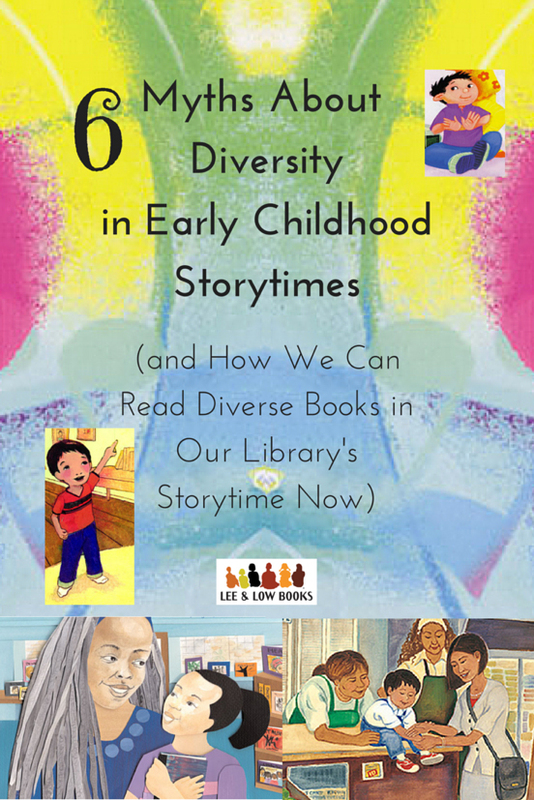 to incorporate diversity and celebrate it in storytime. Book selection for storytime should include books that not only reflect the lives of our patrons and storytime participants, but also the wider world they move, learn and will someday work in. 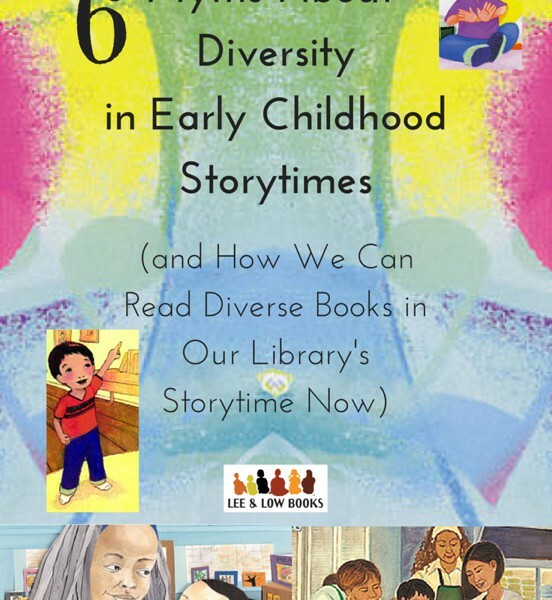 What does it mean to diversify storytime? 1. MYTH: Diverse books are about capital “D” Diversity. 2. MYTH: Holidays make the best time for diverse read alouds. REALITY: Diverse and multicultural books should not be limited to holidays, ethnic heritage months and commemorations. Diverse books should be read all year round to spark discussions of families, communities and geography (just to name a few). When focusing on STEM topics, choose inventors with diverse backgrounds; when celebrating poetry in April, choose poets and anthologies with diverse backgrounds. REALITY: Diversity is always age appropriate. 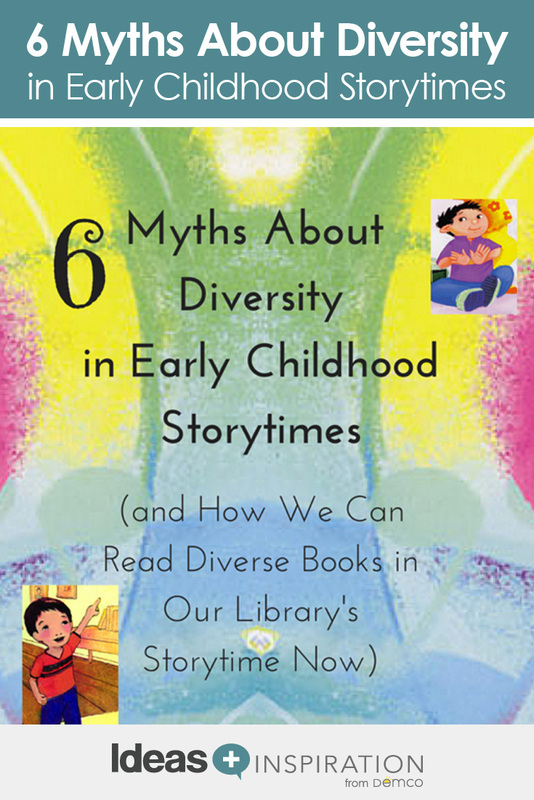 Even if the children attending our storytimes can’t read, it’s never too early to talk about diversity topics. Even toddlers notice the similarities and differences between people. Reading and talking about diverse characters and authors can help dispel or prevent prejudice from taking hold, while also strengthening children’s engagement and helping them make the connection that books equal enjoyment. Talking about the author and illustrator before the start of each read aloud is also a great way to prepare our youngest patrons for kindergarten. 4. MYTH: Diverse books are for diverse populations. REALITY: Non-diverse, non-marginalized and non-minority communities benefit from diverse books. Diverse and inclusive books promote tolerance, engagement and prosocial development (Equal Read). 5. MYTH: Diverse books = folktales. REALITY: Traditional literature is popular, but look for books set in more recent times to avoid the time capsule effect. Fairy tales, legends, myths and fables are fun and have easy-to-spot moral lessons for discussion. However, do not accept ancient stories as substitutes for learning about modern cultures and people. Central America, Sub-Saharan Africa and South Asia (just to name a few) have rich oral traditions and a wealth of folktales, but literacy programs often under-represent modern-day narratives and modern-day minority writers until high school. Reading with young children allows us to head off stereotypes and demonstrate that seemingly far-off cultures aren’t just rooted in the past but have vibrant modern-day ways of life. 6. MYTH: Any book about our patron community will excite readers. REALITY: Representative texts should always be a good story and culturally authentic. If we want our youngest patrons to stick around to the end of the book, we need to make sure we are selecting a high quality, meaningful, engaging and culturally authentic story. How do the author and illustrator relate to the story? Does our selection of books include stories that focus not only on major cultural events, but everyday events that families can relate to? Which books will capture our readers’ family backgrounds, day-to-day lives, fears and dreams? Check out Reading is Fundamental for tips on how to choose the right multicultural book. If you are ready to infuse more diverse books alongside your go-to classics this year and need a little momentum, check out these diverse book lists for ages 0–5 from School Library Journal and Nemours Reading Bright Start. Are many of your patrons and their families DLL, ESL, EFL or ELL? Model your next storytime after the Silicon Valley YMCA’s “Los Dichos de la Casa” program (since 2004). Spanish-speaking parent volunteers co-lead a literacy lesson with a classroom teacher once a month using bilingual books. Each adult alternates reading the text (covering both languages). The follow-up discussion and activity are held in both languages. One of my favorite activities from a favorite resource (The Global Education Toolkit) is International Bread Day (p 32): Every child brings in a sample of bread representative of their heritage (naan, tortillas, soda bread, bagels, etc.) to share. Read aloud pairings include: Everybody Bakes Bread, Hot, Hot Roti for Dada-ji and Jalapeno Bagels. Encourage the rereading of picture books with online libraries! Children love to hear their favorite books over and over, and hearing books read several times helps comprehension and language awareness (Head Start). Several state libraries have created FREE resources for young children and their families. DaybyDayNY and DaybyDaySC feature a diverse selection of books to discover, with a new book to watch online each day of the year, along with a compatible song and activity. Similarly, Storyline Online from the Screen Actors Guild Foundation has created FREE high-quality videos of diverse children’s books, read by popular actors. Read the book during storytime and encourage parents to share the book again (and again and again) with their children online at home. Ready for an exciting challenge? Make a commitment to read books by authors of diverse backgrounds (race, ethnicity, gender, ability, age and so on) for a full storytime year. One Washington Post journalist pledged to read books by minority authors for a full year, and it changed how she discovers books. The experience also sparked her interest in new topics and themes and reaffirmed the universality of human experience. Jill is the Senior Literacy Specialist at Lee & Low Books, the largest independent children’s book publisher specializing in diversity and multiculturalism. Before joining Lee & Low, Eisenberg was a Fulbright Fellow in Taiwan where she taught English as a foreign language to grades 2–6. She went on to become a literacy teacher for 3rd grade in the Bay Area in California and has been passionate about best practices for supporting English language learners and parent engagement ever since. She writes a blogging column for Lee & Low’s The Open Book (blog.leeandlow.com) where she offers teaching and literacy tips for educators. All so true…working in the field a long time I am so pleased to see this articulated so well – thanks! I’m so glad to hear the idea that having diverse characters presented in picture books is a good way of recognizing diversity as a positive aspect of our world. Children need to see people who look like them as well as people who may look different in some way. We couldn’t agree with you more! Glad you enjoyed this blog post.